It's May Bank Holiday Weekend and to celebrate, MyFavouriteMagazines are offering 20% off orders over £15 on Rhythm, Rhythm's 100 Drum Heroes bookazine and more. 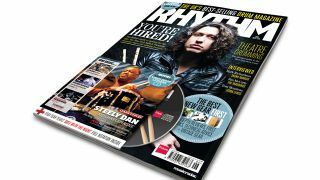 From now until and including Bank Holiday Monday, you can use the discount on individual back issues of Rhythm, magazine subscriptions, the Rhythm 100 Drum Heroes bookazine and more. You might even want to grab a bargain on some of Rhythm's sister music-making titles for your bandmates, such as Guitarist, Total Guitar, Guitar Techniques, Future Music and Computer Music. There is a minimum spend of £15 required to get the 20% discount. Hurry though, the offer is only valid from 24th-27th May!